Salto del Pilón River [salto is a waterfall] : The legend says that this was an enchanted waterfall where the Spanish wanted to steal the treasure that this “salto” hid. La Villa River : This river is located in the limit of the Provinces of Herrera and Los Santos; it is visited a lot by people on summer time, since it is a river with a large flow. Its name, according to the people of the town, comes from deer that napped in adjacent areas of this beach. It is located in the District of Pedasi; nowadays it count on a Bar-joron [bar-joron is a bar located in a hut]. Besides it has huts properly covered that are useful for lodging the tourists. Because of its powerful and big swells, this beach is very visited by national and foreign who love surf. This is located exactly in the mouth of Tonosi River and approximately to 15 kms. of the head of the District of Tonosi. It is a place that is characterized by its intense fishing activity, by their strait location between the sea and the hills that border it. This beach is located at south of the district of Tonosi, approximately to 27 kms. of the district head. The crystalline water of this beach invites to go for a swim, to practice aquatic sports, underwater observation and fishing. It is found located in the District of Guarare; it was declared national monument according to Decree of Cabinet Nº 292 of September 4 th, 1969. The professor Manuel F. Zarate, was a great agent of customs and traditions of our towns. The museum was built with the help of the “Guarareña” community [Guarareña are people from Guarare, district of Los Santos Province], and some institutions of the government, with the purpose to pay tribute to this distinguish person. In this museum you can see some belongings of professor Zarate, like samples of the different folkloric customs of the Republic, besides other folk objects. 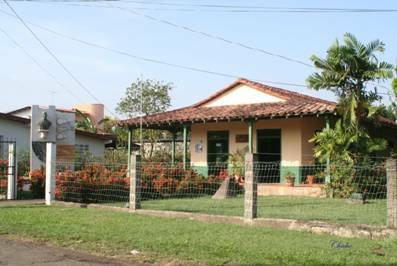 Museum of Professor Zarate, located in Guarare on the Azuero Peninsula of Panama. Come see the rich culture of Panama, learn how towns like Pedasi, Las Tablas, and Guarare help shape Panama’s culture. The Azuero Peninsula is the center of traditional customs that shape everyday life in Panama. 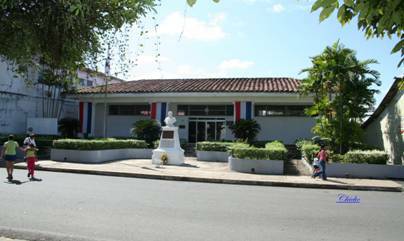 This museum is located in the District of Las Tablas and was founded by law No. 43 of December 17 th, 1953. It was built to exalt the life of the three times President of the Republic, Dr. Belisario Porras. In this institution they provide interesting information to students, professors and others visiting. The Mausoleum is found in the center of the “Casa Museo” [Museum House]; in its walls there is a gallery of photos of Porras’s life, medals, diplomas, and other documents of the great leader. This museum honors Dr. Belisario Porras who was President of the Republic of Panama. His museum is located in Las Tablas, on the Azuero Peninsula. Las Tablas is the cultural center for Carinval. Many people come to the Azuero Peninsula, Pedasi, Las Tablas for the beaches, music, and traditional activities. Important historic monument of the Villa de Los Santos, which in its interior has articles of the independence of Panama from Spain. In this institution they offer all kinds of information of historic character. The place where nowadays is located this museum has had several functions, such as Room of City Hall, Military Headquarters; at the beginning of this century and on 1973 is declared national historic heritage. Las Tablas is the place which is attributed the celebration of carnival with the famous “tunas” [tunas are groups of people who gladly go together up/down the street, singing and dancing with rhythm of the music sound] or contrary side, customs that adopted the neighboring towns in the region of Azuero and populations inhabited by families originated from said region. Currently, the carnivals have taken a great booming in places as La Villa de Los Santos, Chitre [Herrera], Parita [Herrera], Santo Domingo [Las Tablas], La Palma [Las Tablas], etc. The Carnivals had its origin in the 19th Century, with a single “tuna” in Las Tablas city; with the pass from the time, the clashes and other types of activities in the “tableño” carnival was given. The carnival began with the famous phrase “Echar Puyas” ["to Throw Gibes"] or to criticize the rival sides given then in the celebration of the festivals of Santa Librada [Saint Librada], but a Bishop in that epoch considered it profane, advising then to change it for the carnival; from that moment the carnival with his respective “tunas”, was earning more fame and color by the quantity of elements that involve the “tunas” and this it was changed for the epoch of the pre-Lent. Saturday of Carnival (night of fantasy). Sunday of Carnival (night of custom of coronation). Monday of Carnival (night of customs and luxury). Tuesday of Carnival (night of the national dress: “ La Pollera”). It is necessary to point out, that from Saturday until Tuesday of Carnival in the morning, the traditional “culecos o mojaderas” [in the Panamanian vernacular language, the “culecos o mojaderas” are public festivals in the open air, in which the participants jump and dance while they are damped with water by tankers] are carried out where the queens with their respective “tunas” leave around the park, dressed with customs and “puyas” [gibes]. The tankers are located in the park, which throw water for all the people that are found there. On Ash Wednesday at 5:00 a.m., the two queens leave to stroll with their respective “tunas” around the park, dressed with their “polleras” [national dress]. They begin to compete to see who burns more artificial fires; all this is called traditionally "The Burial of the Sardine". After all this, in the afternoon begins the traditional Mass of the Ashes, which is the introduction of the Lent Period, which is carried out 40 days after carnival. Here is a sample of a Traditional Carnival ceremony in Las Tablas, located on the Azuero Peninsula. Carnival is the biggest event in Panama. The Azuero Peninsula is rich in culture and history. 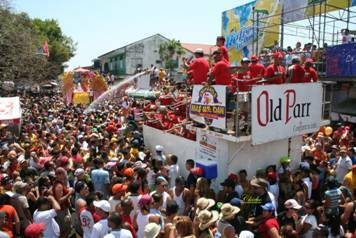 Many people travel to the Azuero Peninsula, Pedasi, and Las Tablas for Carnival. Here is a traditional float during Carnival in Las Tablas, on the Azuero Peninsula. 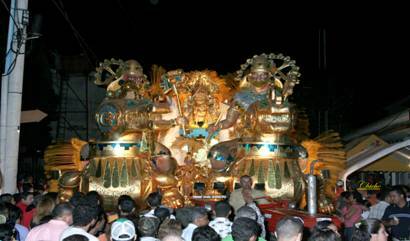 Countless hours and money goes into the building of these floats for this major event in Panama. Carnival is a great experience for anyone looking to see the true culture of Panama. Visiting towns like Pedasi and Las Tablas on the Azuero Peninsula for Carnival is an experience that cannot be compared. This is the day party during Carnival. This picture was taken in Las Tablas on the Azuero Peninsula. Notice the huge number of people and the water cannon spraying everybody. 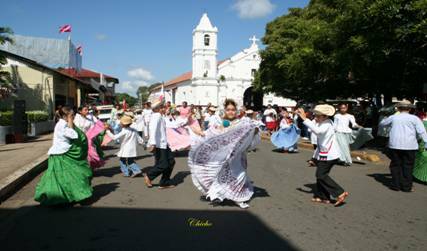 The Azuero Peninsula during Carnival shows all the traditional customs of Panama, as well as some of the best parties Panama has to offer. This picture shows another typical extravagant float during Carnival in Panama on the Azuero Peninsula. 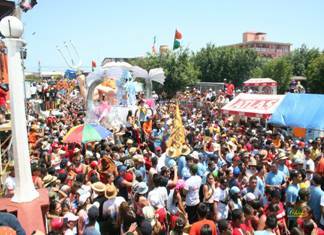 People flock to the Azuero Peninsula during Carnival for the parties and the cultural experience. The beaches on the Azuero Peninsula offer a chance for people to take a break from all the fiestas and people. Don’t forget that property on the Azuero Peninsula and real estate in Pedasi are great investment opportunities. “ La Pollera”: The “Pollera” is a replica of the dresses that the Spanish peasants used. This dress is comprised of two pieces; a blouse and a “pollerón” [“pollerón” is the skirt of la “pollera”]. There are two types of “polleras”: for task or work and of gala. • “Polleras marcadas o en punto de cruz” [“polleras with cross stitch]. The price of these “polleras” depends on the kind of stitch work that be carried out, while more stitch works they have, more costly they are. The price oscillates among $2,000.00 to $5,000.00 dollars. Here is a sample of the traditional Panamanian dress worn during Carnival, the Polleras. These dresses are made by hand right here on the Azuero Peninsula in towns like Guarare, Las Tablas and Pedasi. During Carnival one must visit the Pacific Coast of Panama and the Azuero Peninsula. The Bullfights : They are the popular play of bulls where the cattle raisers of the town and some adjoining places carry their braver bull so that the bullfighters do gala of their ability. These activities are animated by the whistle (that is a flute or a harmonica) and the “caja” or sound-box (is a music instrument made by wood and skin of cattle) with its cheerful melodies. It is a custom that has elapsed of generation in generation and that is inheritance of the Spanish conquest. 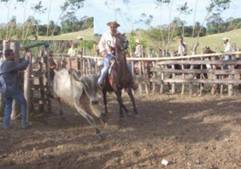 This is a traditional bull fight on the Azuero Peninsula. 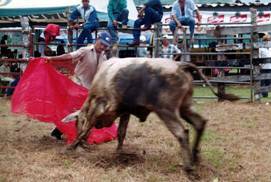 Towns like Pedasi and Las Tablas often have bullfights as well as rooster fights. It is quite the experience seeing a local farmer get into the ring with a bull. The Azuero Peninsula is no longer the dark horse of Panama. It’s rich culture, beautiful land, and breathtaking beaches have been discovered. Now is the time to invest in beach front property in Panama, but focus on the Azuero Peninsula. The “Hierras y Lazos” : These are activities that are carrying out by our country people; at the beginning they were given like recreational activities, subsequently, with the pass of time, they have become sports to national level, since national and also international championships are carried out. The “Hierra” consists of knocking down the animal in the less possible time, getting it for the tail and throwing of him; while the “Lazo” or lasso consists of binding the animal in the less possible time and without making mistakes or fails. Here is another traditional event taking place on the Azuero Peninsula. The majority of people who live on the Azuero Peninsula are cattle farmers. The lush grass and gently rolling hills of the Azuero Peninsula are perfect for farming but also for real estate. Make sure you visit Pedasi and Pocri to see the stunning beaches and unparalleled investment opportunities that await you in the area. Here is a local farmer using his lasso to bring down a bull. 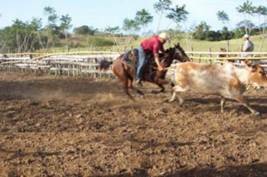 The Azuero Peninsula always has events going on such as this. Towns like Pedasi, Pocri, and Las Tablas can be counted on to have something entertaining every week. Buying real estate on the Azuero Peninsula is not only a great investment but will expose you to a vibrant proud culture, the culture of Panama.